Few Wicked Stepmothers can rip through the screen like a gloriously begowned Bernadette Peters leading her itchy, snorting, poem-gnashing daughters to the Prince’s Ball. 7 Tony Award nominations, 2 wins, 8 Drama Desk nominations, 3 wins. TV actress whose recent roles include the morally dubious Lenore Rendell on The Good Fight. Author. Co-founder of Broadway Barks with Mary Tyler Moore. And, as we see in our header photo, Dolly on Broadway last year. The most-distinctively voiced Bernadette Peters will no doubt command the stage when she embarks on a concert tour that includes a * March 9th performance with the Vancouver Symphony Orchestra. Marvin Laird – composer and Peters’ long-term musical director – will be conducting. She is a true professional. You might have seen her Gypsy performance at the 2003 Tony Awards. Knocked out by a serious respiratory infection, she had been advised to stay home and protect her vocal chords. But Peters, a nominee for Best Lead Actress in a Musical, charged onto the stage, threw herself into Rose’s Turn, and earned one of the longest standing ovations in the show’s history. While you’re on the VSO site, discover more about Otto Tausk, the new Music Director, and check out the offerings for the VSO’s 100th year, including a day of music on January 26th where 1000+ musicians will be featured across 10 stages from 10 am to 10 pm. The VSO’s 2019 year schedule also includes concerts with Itzhak Perlman, award-winning Canadian violinist Kerson Leong, pianist David Kadouch playing Beethoven. You can see Maestro Bramwell Tovey – now Music Director Emeritus – conducting Louis Lortie playing Beethoven’s Piano Concerto No. 2. And, for those who go way back with the VSO, the return of Conductor Laureate Kazuyoshi Akiyama revisiting pieces – Mozart, Mendelssohn, Bach, Respighi – from his first concerts here in 1972. And how better to wrap up the 100 year season than with the VSO accompanying a giant screen viewing of Harry Potter and the Half Blood Prince. ‘The Vancouver Symphony Orchestra regrets to announce that the Bernadette Peters performance on March 9th, 2019 has been postponed to June 27. Current ticket-holders who cannot make the new date are eligible for an exchange. We apologize for any inconvenience that this may cause. 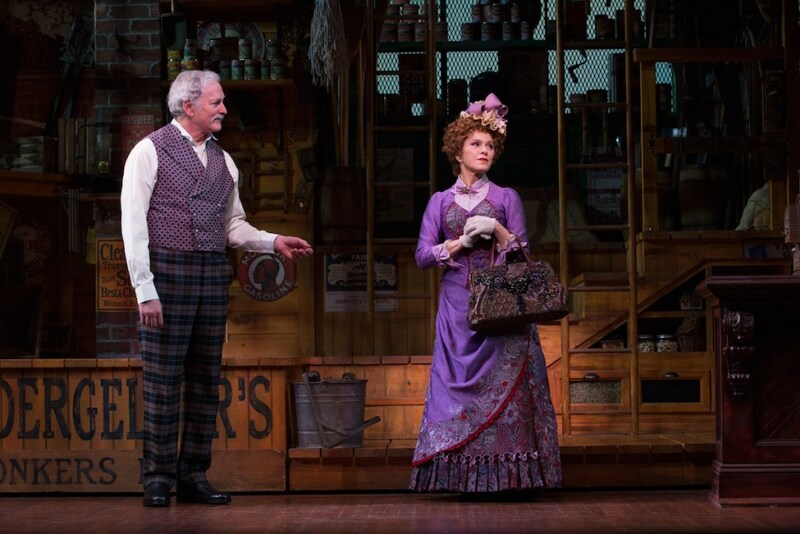 Ms. Peters and Victor Garber in the 2018 Hello Dolly on Broadway.